Former cricket captain Imran Khan administers oral polio vaccine to children in Akora Khattak in Khyber Pakhtunkhwa province of Pakistan. Credit: Ashfaq Yusufzai/IPS. PESHAWAR, Pakistan, Jan 3 2014 (IPS) - The Taliban are proving to be a huge stumbling block for Pakistan as the South Asian nation – one of only three remaining polio endemic countries in the world – tries to fight the crippling disease. Not even top Islamic scholars have been able to make a dent as militants continue to kill polio workers, and ask parents not to vaccinate their children. The Taliban are hampering vaccination work in all provinces, say health workers. The situation is particularly grave in Khyber Pakhtunkhwa and the Federally Administered Tribal Areas (FATA) in the north of Pakistan. “On the one hand they claim to promote Islam, on the other they defy Islamic scholars." “It is a matter of concern that the Taliban carry on despite the decrees issued by religious scholars in favour of vaccination,” Maulana Samiul Haq, chancellor of the Darul Uloom Haqqania, one of Pakistan’s biggest madrassas or Islamic seminaries, told IPS. He too had issued a decree a month earlier, calling upon parents to vaccinate children against poliomyelitis and prevent disability. The disease is infectious and mainly affects children under five. 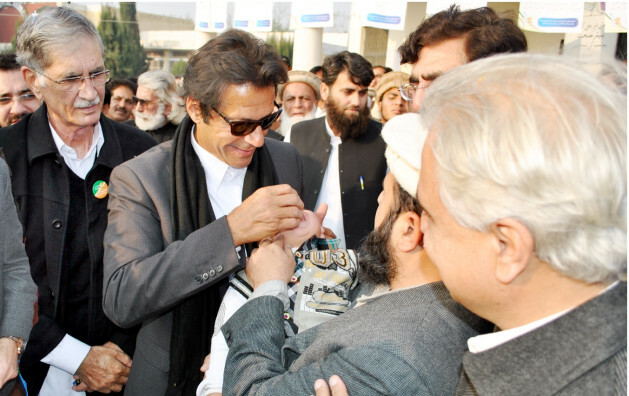 “We appeal to the Taliban to stop killing polio workers for the sake of our children,” said Haq, who inaugurated an anti-polio campaign along with cricketer-turned-politician Imran Khan in December in Khyber Pakhtunkhwa province. “The notion that the oral polio vaccine (OPV) is a ploy by the U.S. to reduce the population of Muslims is incorrect,” said Haq. Of Pakistan’s 35 million children, 80,000 remain unimmunised, according to Dr Elias Durry, chief of the World Health Organisation (WHO) Pakistan polio eradication campaign. This is mostly due to the refusal to administer vaccine by parents suspicious of it due to socio-cultural reasons. In Khyber Pakhtunkhwa, which has a population of 22 million, about 22,000 children have not been vaccinated. Many parents believe OPV is harmful. And the Taliban have only made things worse. Taliban militants have killed 17 people in polio-related incidents in the province from December 2012 to December 2013, and continue to block vaccination. Khyber Pakhtunkhwa recorded 10 of the 76 new polio cases in Pakistan in 2013, while Sindh and Punjab provinces reported seven and six cases respectively. In FATA adjoining Khyber Pakhtunkhwa, the Taliban has banned vaccination since June 2012. Of the 53 new cases in FATA, North Waziristan Agency alone recorded 26. Polio officer Dr Anwar Ali says the situation has gone from bad to worse because there is no let-up in Taliban’s attacks on polio workers. An international conference of religious scholars in Islamabad in June had declared that those killing polio workers were infidels. The edict bore signatures of top religious scholars from Pakistan, Egypt, Afghanistan and Saudi Arabia. Ali said the attacks on polio workers have escalated. The Taliban continue to deprive children of much-need vaccination. In March 2013, three Pakistani religious scholars – Maulana Tahir Ashrafi, Maulana Samiul Haq and Maulana Hanif Jalandhri – were sent to Cairo to seek information about OPV in a religious context. Since their return, they have been trying to persuade the Taliban to allow vaccination, but to no avail. The United Nations Children’s Fund (UNICEF), which supports the government’s polio immunisation efforts, has brought out a booklet containing nearly 40 religious decrees supporting vaccination so as to make parents administer polio drops. “People can be convinced about vaccination if the Taliban accepts religious decrees in favour of OPV,” Ali said. Maulana Muhammad Nabi, a Peshawar-based cleric, points out that the Taliban attack polio workers as well as the policemen protecting them. “It is a matter of grave concern that the Taliban disregard edicts issued by acclaimed scholars about the effectiveness and legality of OPV,” he said. Not only do the Taliban expose children to disease, but also bring Islam into disrepute by refusing to allow vaccination, Nabi said. While preaching against vaccination in Waziristan Agency in FATA, the Taliban had said it was an American tool to spy on them. They argued that the U.S. ran a vaccination campaign through Dr Shakil Afridi to trap and kill Osama bin Laden in Abbottabad in 2011. Mufti Muhammad Mushtaq says he had issued decrees asking his disciples to promote vaccination, but many polio workers had left the campaign due to fear of the Taliban. The Taliban have killed five polio workers in Mardan, a district in Khyber Pakhtunkhwa. “Despite my decree, some 6,000 children remain unvaccinated in Mardan,” he said. Dr Muzam Khan, an immunisation officer in FATA, believes decrees will not boost the fight against polio as long as the Taliban don’t support vaccination. Israr Madani of the NGO International Council for Religious Affairs (ICRA) said, “We have been working with madrassa publications to understand the extent of the Taliban’s influence on vaccination and the role of decrees. The danger lies in the polio virus spreading from Pakistan, which is the only other polio endemic country in the world besides Nigeria and Afghanistan. “Recently, a virus strain from Pakistan was detected in Egypt,” Madani said.